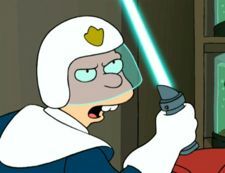 In Futurama, there are two types of lightsabers. The most commonly seen type is solid weapon, despite its laser-like appearance. It is used by the peace officers. It is similar to a nightstick or baton in manner and is used by hitting the subject. The solid lightsaber in use by the police. Fry using one for Piñata. Ignus fighting against Greyfarn's staff. Used for cutting through the Planet Express Ship. This weapon is taken from Star Wars. The "glowing solid stick" type lightsaber is, most likely, derived from modern lightsaber replicas and children's toys which use LED-lighted polycarbonate sticks. Lightsaber sounds are used in "The Six Million Dollar Mon". The giant microscope used in "Bender's Big Score" makes a lightsaber sound when activated. Lightsabers were also used by Sith Overlords in the Sithal War. This page was last edited on 14 July 2017, at 13:46.